Of course, collard green (or any green) wraps are only useful when they don’t fall apart, and they’re a little tricky to get right at first. A few of you have been asking me about how I get mine to stay neatly together, so today I figured I’d pause to give you all a little tutorial. Don’t worry: I promise this is a lot easier than my physics homework. 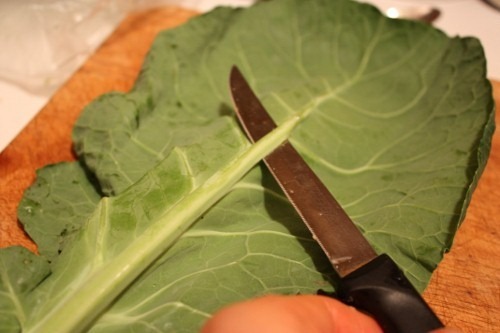 Careful as you do this: you don’t want to cut so deep that you actually cut through the leaf! Just follow carefully along the spine, slicing away only the thick part of it. …so that the side you didn’t cut is facing up. 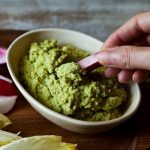 I use hummus, nut pates, sauces, mashed potatoes, and all sorts of fillings! Get creative. I used my new favorite hummus—sweet potato hummus—here. (That recipe’s coming atcha soon!) I usually find that 1/4 of a cup is the right amount per leaf. If I’m using a nut pate that I know is very calorically dense, I may use only 2-3 tbsp instead. In this case, I rolled from right to left. And voila! 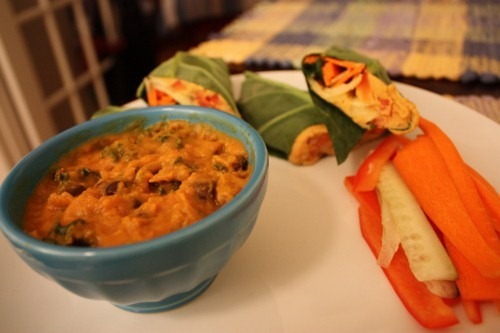 And serve, or wrap tightly in foil, saran, or cloth to pack up for lunch or dinner on the go. If you’re suddenly motivated to try a leafy green wrap, let me know what you make! I’ll be back tomorrow with a 15 minute stew recipe and a recap of an important community service event. Stay warm! Just made some delicious collard wraps for lunch! I love them filled with hummus, sprouts, veggies, avocado, and a little miso mayo. Thanks for the tutorial – I was cutting the stem too high and couldn’t figure out why my wraps never held together! Plus, I was using the wrong side! 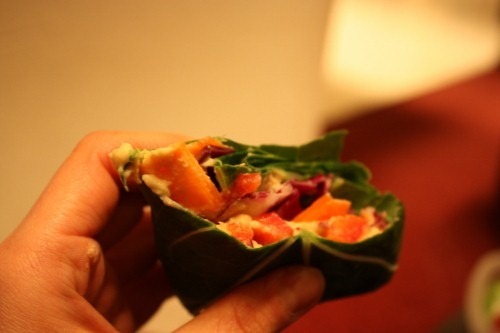 I can never get collard wraps to stay together, so thank you so much for these tips! Thank you for the tips! Every time I make a wrapped sandwich, it’s awfully messy. I need to make a portable lunch for school next week and I am definitely going to give this a go! We do use Halliday. UGH. Such a pain, this class — I can already tell it’ll be my downfall. And Ada, sorry not to comment sooner thanking you for your warmth and good wishes as I start school! We’re just an avenue away from each other uptown, and I go to Millbank plenty for the Calc help room, so I do hope to see you soon 🙂 We can support each other. ha, I remember Halliday. we were not great friends either. the help room is definitely your friend! And so are those random analogies you’ll be making ever more of (the x axis of the collard). concepts are learned best when they are based in sensory experience or imagery, so food analogies are perfect! Great idea for a portable lunch. Looks delicious. Do you think these could be made the night before? I am a bit of a zombie in the morning and like to do as much as possible the night before. Sure you could! And yes, I’ve made them the night before. Wow, Gena. This is a winner! I just made some for lunch tomorrow and had to make an extra one to eat right now. I used lentil-walnut pate and apple slices. Just fantastic. Thanks for this — they look delicious! I’m always looking for ways to use collards, chards, and kale — I fell in love with them while growing them on a farm, and MUST have at least one of them every day! 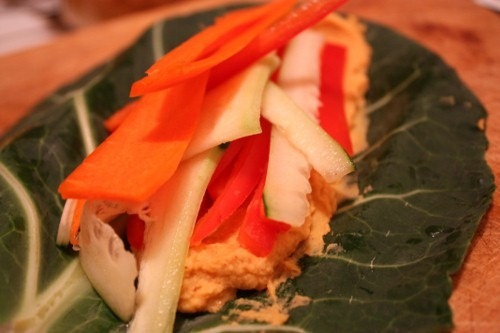 I made another round of crazy awesome hummus that is just begging to be placed in a wrap! Great tips! This is so helpful! I always wondered…. Hmmmm. I sure need this tutorial. 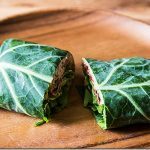 I’m a huge collard wrap fan (had one today, with a quinoa-black bean salad filling) but I usually resort to a fork and knife to eat it 🙂 I’ll give your suggestions a shot. 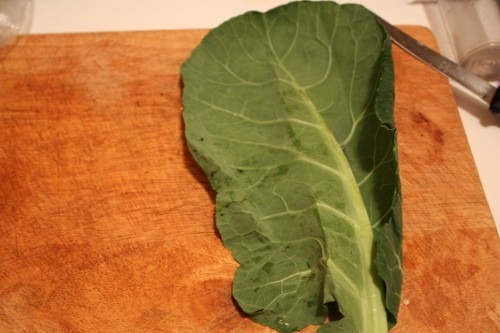 As much as I love slow-cooked collards, I’m not a fan of them raw. 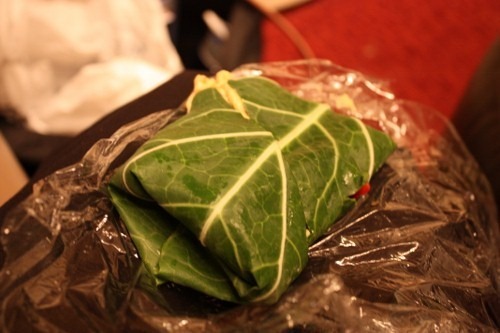 🙁 I really wanna like ’em because collard wraps are so pretty! 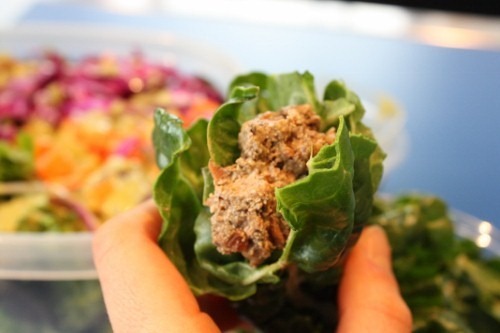 I tend to stick with romaine for raw wraps. I love collard wraps, but mine always fall apart! THANK YOU for this!! I could totally make these! Yum yum yum! Thank you for making them look so easy! AND, I have a store trip schedule this evening! YES! 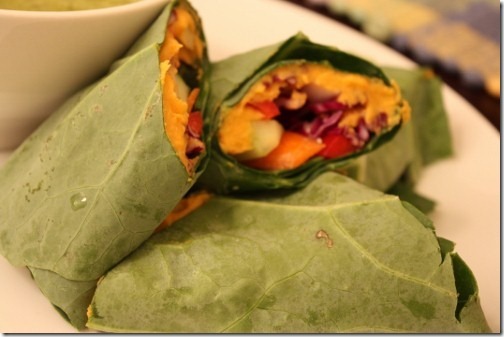 I’ve actually been eating tons of collard wraps lately as well! 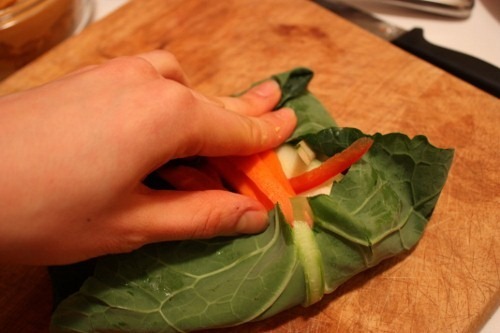 Definitely appreciate the tutorial though- still perfecting my collard wrapping technique. This week I’ve been filling them with two of your recipes- cheesy red pepper hemp dip and raw broccoli hummus- along with a variety of bell peppers. Yum! Ooh! I haven’t tried collard wrap yet, but since I’m having a hard time with the banana sushi, this would probably an epic fail. So… thank you for this tutorial, I’ll make sure to have it around when I get my hands on collards! 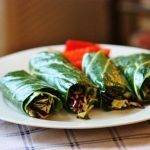 I tried collard wraps after seeing them on your blog and I have to be honest here, they just did NOT work for me. Oh they held together just fine, I just couldn’t stand the leaf taste. Tried steaming them too but blehhhhh. 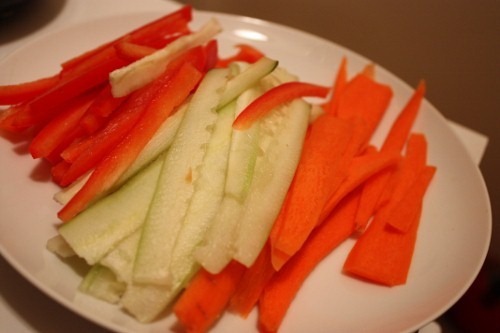 I just cringe when I see them now, but I’m jealous that you can enjoy those healthy bites! Not trying to yuck your yum, just wanted to note they’re not as innocuous as they look. Ha! No, they’re not innocuous. They’re very strong tasting, but I’ve got a good taste for dark greens, and the fillings REALLY do help! I’ve never tried slicing the stem off, but not cutting it entirely off. I usually end up cutting it into two halves and filling each one. I like your method and will give it a go tomorrow (I have collard wraps planned for a picnic lunch with my munchkins). Thanks! Now get back to that Physics work. I hated, hated physics. My mind just didn’t work that way. Chemistry and Biology I loved. Physics, not so much. Good luck! 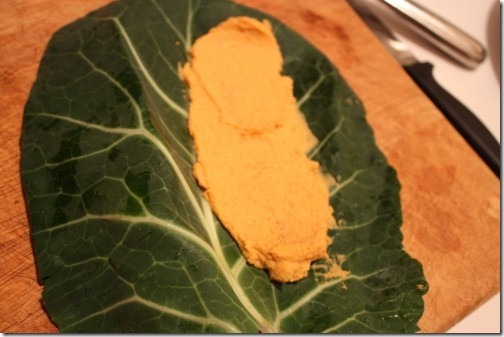 I made your Cashew Curry spread and wrapped it in cabbage and romaine leaves. It’s divine and I’m planning on trying it with hemp seeds next. The combo of calming sweet spices I think would work well with their strong flavor. Thanks so much for the tutorial! I finally made my first successful collard wraps today! WOO HOO! I used a raw cilantro slaw, some dijon mustard, chickpeas and broccoli. Random, but it was yummy! This is going to be my new “go to” meal! Thanks for this great tutorial. 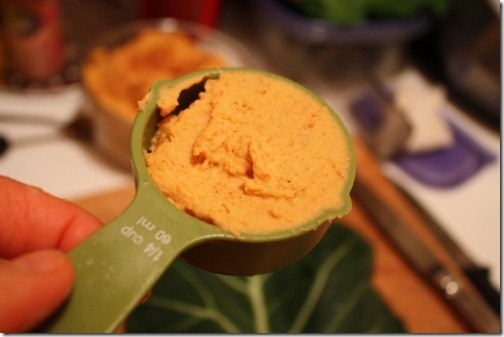 I’m looking forward to the sweet potato hummus recipe! Great tips! I have collards in the fridge because I’ve been craving a nice stuffed collard wrap! I also tried them with a mushed together version of your polenta stacks, minus the polenta. Really good! Ooooh they look perfect! And they stay together. And are all neat and tidy. Lovely oragami 🙂 That’s how i feel about cabbage wraps. They are oragami..you never know where to fold, crease, wrap..you just pray for the best. Collards are a bit more predictable. “along the x-axis.”–omg I had a flashback and nightmare for a second. Whew. Better you than me in physics and math classes! The soup looks awesome too! These look yummu! I need to add collards to my list of greens for the gocery trip. I can barely keep kale and spinach in my house as it is! Great tutorial! I’ve been dying to make some of these and wasn’t quite sure how to throw it all together. I never thought to turn them inside out like that. I did a tutorial at some point this summer. People kept asking me how to make them! I had to watch a video on youtube at first because I was so confused. I saw another sweet potato hummus mentioned today on twitter. It must be the next BIG thing. 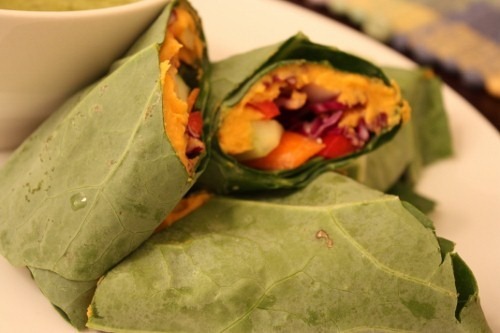 Collard wraps are so so yummy! thanks for posting this.. I know that it will motivate people to make them. Thank you! I was JUST thinking about asking how to do this! I think your increased wrappage have been inspiring a lot of people lately because I am seeing them all over the blogworld. Great, great trending. I bought some swiss chard at the beginning of the week and since I’ve been back in the dorms I’ve made wraps twice. I can’t thank you enough for doing this post because I’m really stressed and struggling to find something easy and portable to take to classes with me and this might be the solution I was looking for!! This is awesome, especially since Im always looking for new creative lunches to pack for work! 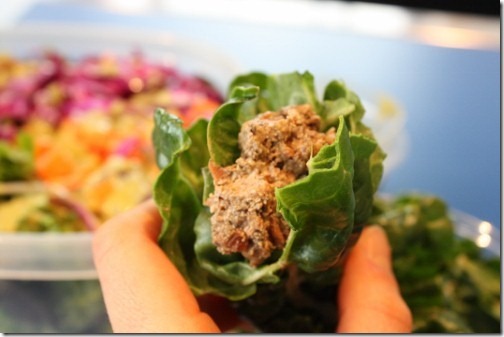 Awesome portability without the heaviness of sandwich breads…love the concept! Slicing off part of the stem… It’s so simple, so obvious and yet so brilliant. As a pre-workout snackaroo I wrapped a banana in collard greens a la your breakfast a few posts ago sans nut butter and it was so good and convenient. 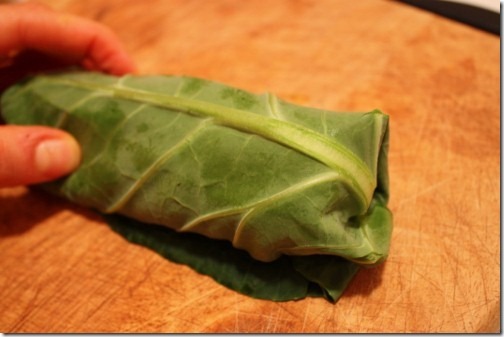 This will be a staple of mine and I will experiment with more collard wraps. Sweet potatoes, chyess! My teeth are sensitive to sweet/sour fruits but having greens with them seems to balance the sweetness/acidity. It doesn’t align stringently with food-combining for maximum digestion but it has felt good so I’m going to throw satsumas in my salads while they’re in season (so sorry to rub it in but it’s sunny and 60F in San Fransisco this week and there are heaps of local citrus at the farmer’s markets). On a tangent, I got some king trumpet mushrooms in my CSA this week. What should I do with them? I also got a ridiculous amount of onions from my CSA (also not a huge fan)…like a whole bag. I’m thinking of dipping them in cooked cornmeal and baking them ’til crispy- a healthful play on onion rings. Thoughts? These look fantastic – I love endless possibility! Sure! But dino kale will work better than curly. If you use kale, find as flat a leaf as you can. gena, it’s like you have read my mind with this post! 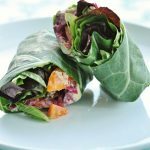 these past few days i have been searching your collard wrap entries for a tutorial on how to successfully wrap one, and now here it is! i’ve attempted two wraps this past week, and though they’ve turned out delicious, my wrapping style wasn’t quite working and they ended up pretty messy. so thanks so much for this post – i’m inspired to try again! 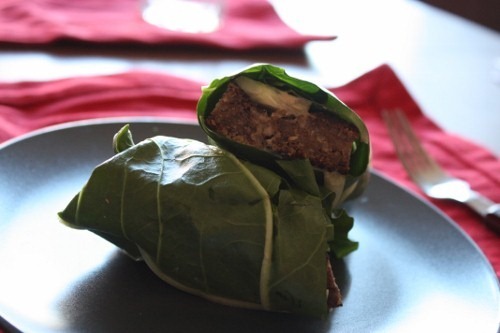 Thanks for this info Gena-your collard wraps are divine! Especially the one with Indian spiced veggies . . . oh my! I haven’t made these in months and have some fresh collards in the fridge. You just decided my lunch for me. I love these wraps. Yesss! Thanks for the tutorial! They look delicious . 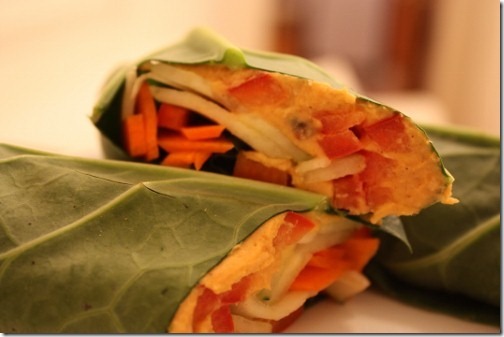 The vietnamese also make alot of leafy wraps .I am gonna try make some with sprouts , cashews , coconut ,carrot , cucumber ,mushrooms, mint , coriander , garlic, lime , chilli … and a sweet chilli dipping sauce . 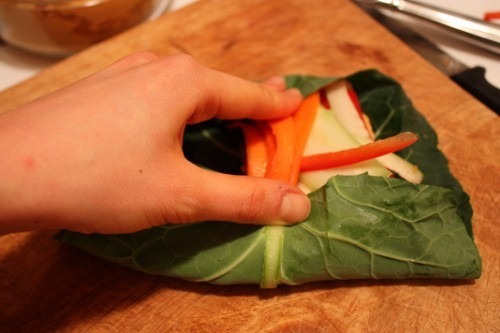 Thanks for the tutorial, I’ve been a huge collard wrap fan too lately for fun lunches and salad alternatives. These wraps look delicious, such a great way to pack more veggies in to your diet! perfect timing. 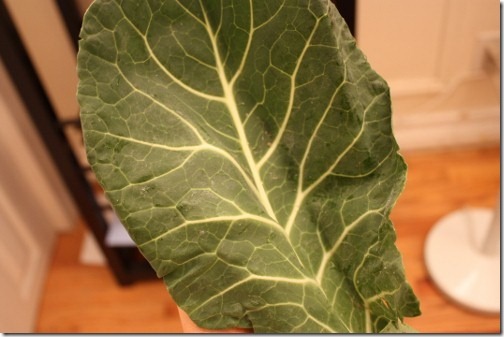 i just bought collard greens after seeing so many of yours lately…drool on the keyboard was getting old. i love the nerdy references. kyle gets so over the dumbass references i make about ekgs and electrolytes and lab values. oy. Sounds awesome. 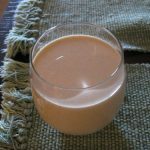 I’m currently starting a raw food lifestyle(day 2) so I’m always looking for more recipes since I’m new to all this. Perfect timing! We’ve got some great-looking greens at our local co-op and I was just thinking of doing wraps. Thank you! Looks delicious! Thank you for the tutorial; I hope I can make them without all the ingredients falling out! This tutorial was just in time for my meal planning next week. It will be a busy work week where I won’t have much, if any time to eat lunch. When things get like that I usually end up eating Vega/Lara/Prana Bars and maybe some nuts/seeds and fruit at my desk. Obviously that gets old and will end up not getting any veggies in during the day. I’ve tried to eat a salad at my desk, but it doesn’t work and it ends up getting warm and wilty and then I never eat it. These will be perfect! I can grab bites between phone calls and such. Thanks Gena! When you dine out, do you find it ‘normal’ for the salad to be sprinkled with salt? Nice blog you got going here. Glad to stumble across here. Hi, thank you for your great blog and pix! I found you when healthy girl’s kitchen blog posted about yours:) So cool. I made these wraps today in a cooking class, and seeing that you trim the stems made them much more manageable to wrap. Thanks much for your yummy and creative recipes and I look forward to seeing more. Hi! I’m new to your blog, but wanted to say that I’m so happy I saw this. I am trying to incorporate more greens into my diet especially Swiss Chard. I’ve never tried it raw, and always cook it the same way…the only way I knew what to do with them. I’m going to try this today!! Thanks for sharing!! 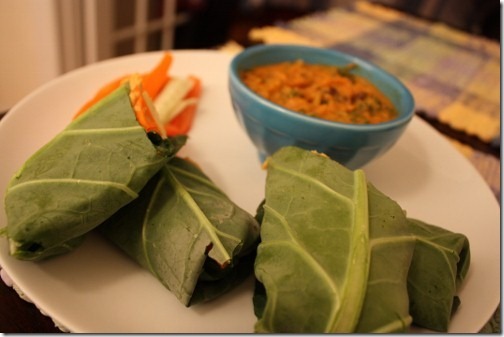 My first collard wraps (with sweet potato hummus) were a huge hit. I added some sunflower seeds into the mix for crunch. Thanks so much! OK. Now I’m kind of sorry that I followed this link because I’m feeling compelled to try this idea. It just seems so healthy and sensible to make something like this the night before when you know the next day is going to be crazy. Just grab it in the morning on the way out the door. I probably will try it at least once – and see how I handle the chewing of the greens. I don’t think I’ve actually seen collards in the store, so might have to try something else – maybe find something that isn’t too tough to chew. Thanks for the yummy tips! You mentioned a sweet potato hummus that would soon be posted, but I searched your site and couldn’t find it. Will/did you share it, please? It’s in my recipes section (recipes, not recipage). Enjoy! Thank you SO much for making this so easy. I had so many messed up wraps before this tutorial.Still edible, but just not as pretty. Collard wraps are awesome. Esp with a yummy curried seafood salad inside. Thanks for posting ths tutorial! 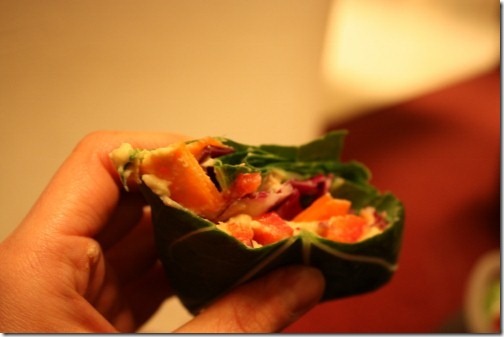 You inspired me to make these wraps and they are great! 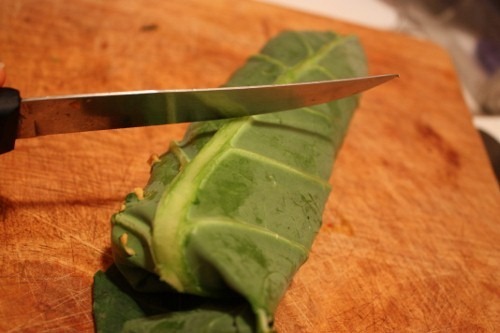 I thought the raw collard green was very good. I also used alfalfa, fresh cremini mushrooms, and radishes in my wraps. I really like what you’ve acquired here, certainly like what you are stating and the way in which you say it. You make it enjoyable and you still care for to keep it wise. I can not wait to read much more from you. This is actually a tremendous web site. Thanks for the steps. 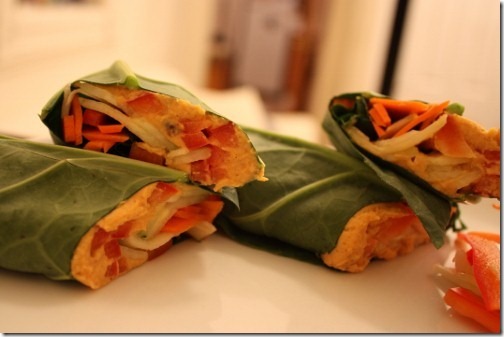 I have LOVED the wraps at the local market, but hadn’t yet ventured to try them at home. THANK YOU!!! You are so welcome! Glad you like! They look beautiful and delicious! Is there any reason they would not freeze well? Could be a good way to turn those less-than-a-serving leftovers into a quick future lunch.